We've been looking forward to tomorrow's Rock to Rock Earth Day Ride for months. Last year's was among one of our most fun days in New Haven since we moved here almost three years ago. You see-- while there is a growing bike riding community, we're no Portland, Oregon. I read blogs that continuously highlight fun community rides with envy. While there are regular group rides here in New Haven if you are a cyclist-- one of those lycra-wearing, racing kinds-- but outside of a monthy Critical Mass (that meets inconviently for us with little boys who desperately need to eat at 5:3oPM at you guessed it, 5:30PM), there don't seem to be community rides for us overweight, jean-wearing (never lycra!!! ), mama types like me. One of the reasons that last year's event was such a blast was the array of folks who climbed on their bikes and joined in taking over the street on two wheels. This year, it seems like there will be far more riders and many more of our friends have committed to riding as well. It'll be a party! 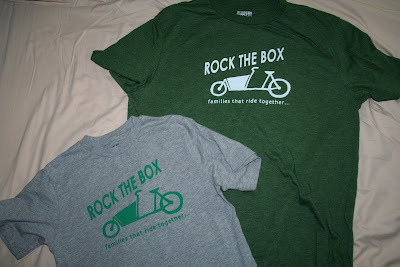 When our friends who recently bought a Joe-Bike box bike came over to show us their new wheels, L said, "We should get team t-shirts for Rock to Rock." Suddenly that got my mind whirling. 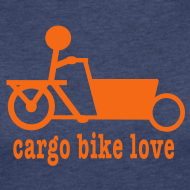 You see, besides being obsessed with bikes, my other obsession is making t-shirts. 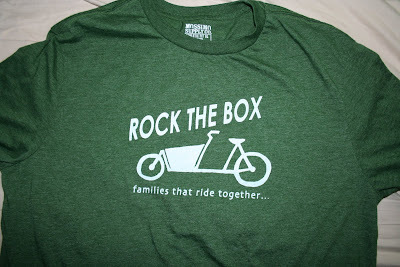 I started with creating shirts for my boys from those websites that let you customize shirts (like my Boys Like Pink, Too shirts-- see sidebar) and moved on to freezer-paper stenciling shirts. Early this winter, I tried to up my game by purchasing an at-home "easy" screening system called EZScreenPrint. I made a few screens in December with varying degrees of success, but I struggled with getting the timing right while exposing the screen to sunlight, and got crazed with work and buying a house so stopped messing with hand-screening for these months. Soooooo, in order to avoid packing (moving day= this coming Wednesday), this week I suddenly decided to give the screen printing another go. On Tuesday I came up with a design, created the screen at 6:00pm after work--yay, sunlight in spring evenings!-- ran off to Target while P oversaw boy bedtime ritual on his own, and finished 13 shirts by 11:00PM. I have to admit that I am quite proud of the finished product. 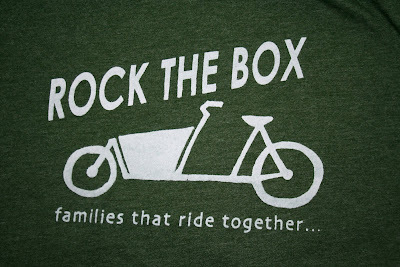 I made shirts for two families with whom we are friends who own cargo bikes. 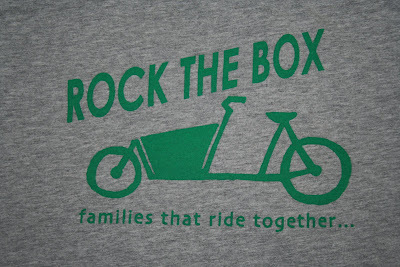 The adult shirts are in green with white print; little people ones are gray shirts with green print. I have to give a major shout-out to Travis Whittwer for his design inspiration. Many thanks. Wow great shirts! You are so creative! Very cool! Where can I get one? Sarah, you are truly crazy. Crazy amazing, but crazy. I have missed seeing you around CH.